For many years 3D printing was inaccessible to smaller companies and remained only a viable solution for large enterprises because of its huge price tag. But now as costs plummet, making 3D printing more affordable than ever before, the technology in the 3D printing industry continues to improve and progress at an incredibly fast pace. SYS Systems provides 3D printing solutions across the UK and Ireland, as Platinum Partner to Stratasys, we only supply the best 3D printing innovations. Our systems are guaranteed to improve productivity, accuracy, efficiency and design confidence as well as reduce expenditure and time. Fused deposition modelling (FDM) printing technology produces the strongest, most durable thermoplastic 3D models that contain fire retardant properties (ULTEM 9085 thermoplastic). Making FDM technology the number one choice for rapid prototyping in the Aerospace industry, reducing time and money spent on CNC milled parts whilst increasing product performance. It works by taking the CAD file and slicing the design into 2D cross sections to prepare for the build process and with this determining a path. Then using molten thermoplastic filament ejected through an extrusion nozzle it builds the 2D cross sections taken from the design, layer-by-layer, producing a 3D printed model. FDM technology produces temperature, chemical, UV, and environmental resistant thermoplastic models that do not absorb moisture. SYS Systems supply many clients across the UK and Ireland with FDM printing technology, a few are UAV Solutions, Leptron and Kelly Manufacturing Company. FDM technology is also put to use in the medical industry to produce customised fixtures, parts for medical devices, research aids and stronger tooling. Whilst Polyjet technology is also used because it offers multi material choices that allow the user to adjust rigidity, flexibility, as well as its opacity and transparency. This allows surgeons to reproduce organs in model form to determine the best possible solution to the problem. The PolyJet printing process works by firstly extracting information from the 3D CAD file and calculating the photopolymer distribution layout, this preparation separates the CAD into fine layers, much like FDM technology. The 3D printer then jets layers of photopolymer materials, instantly UV-curing the miniscule drops of liquid material. These layers gradually accumulate to produce the 3D model. With PolyJet technology the user is able to orchestrate multiple builds in one production run, thus qualifying for industries like medicine where fast results could save lives. 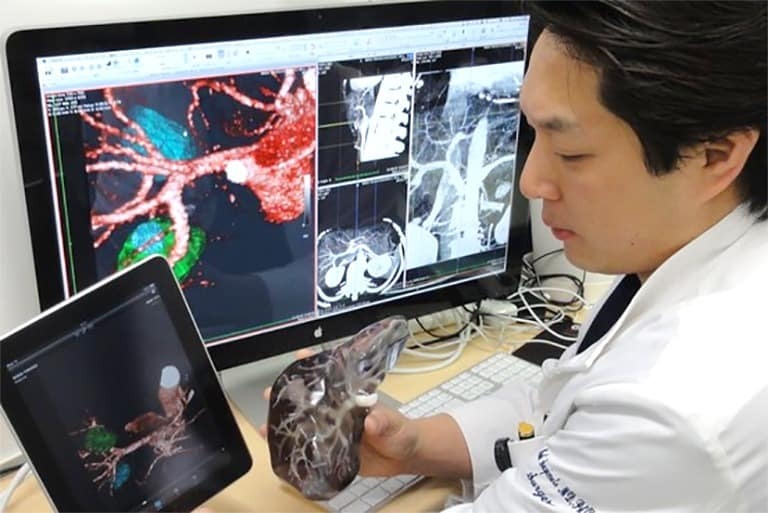 Check out our Top Three Medical Applications to learn more about how Stratasys 3D printing technology is changing lives across the planet. 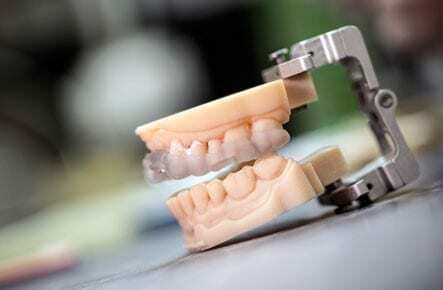 PolyJet printing technology provides solutions for many industry applications including dentistry. With Stratasys Dental Series, 3D Printers supplied by SYS and specifically created to cater to dental industry requirements, users can produce photopolymer material models such as stone models straight from digital files, intricate and accurate veneer prototypes, surgical objects and clear aligners/retainers. From compact desktop 3D printing systems to greater production capacity printers the Objet Dental Series can produce models and prototypes in a variety of Vero photopolymer and bio-compatible materials. For maximum capabilities dental facilities turn to the Objet260 Dental Selection that offers the largest variety of photopolymer material use including Vero, Tango, gum-like and tooth-like digital materials. Stratasys Dental Series 3D Printers provide the perfect solution for dental labs of any size to increase in growth, productivity, quality, and accuracy. Before 3D printing technology architects methods of conveying designs to clients was through computer simulations or even handmade wooden and foam board models but through innovations in additive manufacturing, 3D printing has become an architectural companies preferred method for its ability to produce accurate and complex structures. Both PolyJet and FDM technology can be used for Architectural design structure model purposes because of their high-quality and detailed printing capabilities. Examples of companies that use the different 3D printing technologies include Rietveld Architects LLP based in New York who use a PolyJet-powered Objet 3D printing system to produce architectural design models. As well as the Taiwan-based company, Transference, who create 3D architectural and display models for companies around the world using FDM technology with the Fortus 3D printing system by Stratasys. Using 3D printing technology allows architects to present their clients with a valuable mode of communication as well as develop and refine the building structure by being able to assess the 3D model. By reducing the time usually spent on outsourcing or errors made through miscommunication with conventional methods of structural design representation, architects are now able to further reduce expenditure and strengthen the relationship between themselves and their clients. Don’t forget to keep an eye out for part 2 of our top industry uses for SYS 3D printing technology.